Spectacular and visual, with no set script, these delightful denizens silently advance, communicating and connecting with the public they encounter or take by surprise. 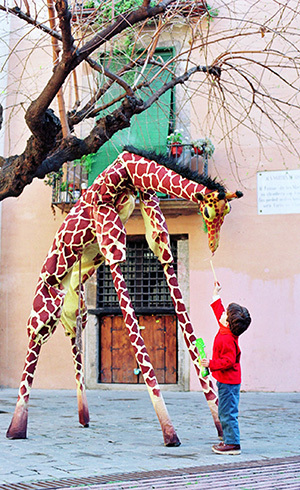 Suggesting another way of seeing the city or any other space, we rediscover them through the ingenious, curious gaze of this gentle giraffe family. A wordless show that's the sheer height of entertainment for public of all ages. The show has widely toured all over Europe, America and Asia.